Kidd: Yes, yes, yes, yes. Kidd: Aw, damn. Where'd I leave it? Severide: Same place as always, kitchen counter. Kidd: Hey, uh, thank you for dragging me out to that charity thing. I had a good time. Severide: Yeah. Sorry you blew off your date. Kidd: Eh, it's cool. He understood. Dawson: Dropped off the last of Bria's things yesterday, her dad looks ten years younger. I mean, recovery's a long road, but I can tell he's committed. Brett: Well, he's got plenty of motivation. Dawson: And now that that's resolved, Casey and I are trying to find some time to reconnect. We've got these spa passes as a wedding gift. Finally convinced him to give it a shot. Brett: Oh, Shambala Wellness Sanctuary. Fancy. Dawson: Yeah, you should get the brochure, make an appointment for yourself. Brett: No, this is overkill. I don't need all this to relax. I'm good with a soak in the tub and some Chinese takeout. Herrmann: Hey, either of you see little Annabelle wandering around here? Dawson: No. Should I have? Boden: Hey, Connie, let's set up a call with Chief Heller to go over those documents. Annabelle: How come your desk is so messy? Herrmann: Hey, sorry, Chief, I forgot about it till this morning, Take Your Daughter to Work Day. Cindy thought it'd be enriching, you know, for Annabelle to see her dad on the job. Herrmann: Come on, now, pumpkin, we're gonna go get breakfast. Yeah. Annabelle: How long do I have to stay? Herrmann: Your mom didn't say. Radio: Truck 81, Ambo 61, Squad 3, traffic collision, 51st and Federal. Casey: Herrmann stabilize the truck! Casey: Hold on, buddy. We're gonna get you out. Deputy Keefe: I got a guy in the rear. Casey: We'll take care of him. Let's pop it. Severide: He's bleeding out, I'm thinking rapid extrication, quick and dirty. Casey: He could have a cervical fracture. Might not survive a hard pull. Let's keep him here, lift and roll the dash and steering column off first. Severide: No. That'll take too long. We have to make relief cuts in the frame first. Otis: Let's get this on… Okay. Severide: Just watch the contact points for slippage. Cruz: Yeah, I think I got it. Severide: Hey! Stop it! Stop! Casey! Casey! Come on, man! Casey: Keep working! Hey, Otis, grab me the strong arm. Severide: Casey, he's gonna snap his neck! Hey, knock it off! Casey: Hey, hey can you hear me? We're losing him. No more time for the column lift. We'll have to do a quick pull after all. Damn it! Cut the seatbelt loose, yank him out! Severide: So where we at? Casey: We're pulling him out. Take his legs. I got his back. Let's go. Herrmann: All right, we're clear! Brett: I got a pulse. Casey: We did what we could. Casey: Severide did his job. Let's just focus on the shift. Herrmann: Right, sure, you're right. Kidd: Aren't you on shift? They just let you hazmat guys come and go as you please? Zach: Detailed to the academy. Zach: Got a little freedom to get out, stretch my legs. Zach: No problem. You want to try again tomorrow? Catch an early movie, make fun of it over some beers? Kidd: Sure, yeah. Uh, I can... I can get behind that. Zach: All right. Anyway, I should get back. Zach: Catch you tomorrow, okay? Casey: No, I know, I don't expect a guarantee, just... Something to consider. Thanks… What's the latest? Dawson: The deputy was headed into surgery when we left. Touch and go. Casey: If I ask you a question, will you give an honest answer, no pulled punches? Casey: Do you think it could've made a difference... Going with the quick pull from the start? Dawson: That's tough to say. The guy was suffering from blood loss, cervical fracture. I mean, you could go down a rabbit hole of what ifs, but my take... Any difference would've been marginal… Listen... The prisoner caused that seat bracket to break. You did your job, you got him out alive. Mouch: It's an uncomfortable concept. Otis: Yeah, it's a little too soon. Otis: I know, Mouch, I know. Hey, hey, Herrmann, uh, isn't the whole point of Take Your Daughter to Work Day to, um, you know, take your daughter to work? Shouldn't you be showing her around the house? Herrmann: Down time in the common room is an important part of the job. It's not all fire and glory. Remember that, pumpkin, okay? Mouch: Maybe we could find something for everyone. How about the nature channel? You like giraffes? Or not. This'll work. Severide: Come on, come on. You're too slow! All right, reset, guys, let's work on that time. Come on, guys, look alive. Deputy Chief's here! Grissom: Good to see you're all keeping sharp. You boys mind if I borrow your lieutenant for a minute? Severide: Hey, Capp, you're in charge. Run it again. Grissom: I hear you had an interesting call this morning. The rumour is that you tackled a, uh... An escaped prisoner, is that true? Severide: Ah, wasn't a big deal. Guy wasn't getting far. I just happened to be in his way. Grissom: That call is actually the reason I'm here. I'm getting a lot of questions from HQ, Sheriff's Office, hoping you could give me your perspective. Severide: I wasn't the incident commander. Grissom: I want all points of view. Grissom: On the captain's orders? Grissom: He or we? Who decided to leave the driver in harm's way? Severide: We. It was a fair call. We operate as a team. Grissom: Uh-huh. Well, I appreciate you giving me the time, Kelly. I'll let you get back to your drill. You tell the big guy to loosen his grip. He's creating too much drag.// Hey, guys. Tony: How's it going, Chief? Grissom: Captain, help me out. All morning, I've got the Sheriff's office in my ear. They say the CFD bungled the rescue of a deputy while cutting a prisoner loose. Is that true? Boden: Just walk us through the incident. I understand the steering column struck him in the chest as you raised it. Grissom: You made the determination. Grissom: Based on the paramedic's assessment? Casey: Based on my years of experience rescuing accident victims. Grissom: No, I don't doubt that, but the fact is, you left him in there bleeding out, fractured neck, with some animal in the back rocking the boat. Casey: There were no good options. Grissom: None? Is that true? What about your squad lieutenant? Did he have any options, or was he in lockstep agreement the whole time? Casey: Why, did he say something? Grissom: I'm just asking a question. Casey: All due respect, my squad lieutenant wasn't in command of the scene. Grissom: That's still not an answer. Casey: There's a chain of command is the only answer that matters! Boden: Casey… Yes? Thank you… That was Chicago Med. Deputy Keefe... Died 20 minutes ago. Casey: Family's holding a vigil tomorrow. I'd like to make an appearance. Dawson: Of course. How'd it go with Grissom? Casey: Managed to keep myself on the right side of an insubordination charge… Severide. Casey: Deputy didn't make it. Casey: Found out while I was getting interrogated by Chief Grissom. He suggested the two of you had a conversation about the call. Casey: Well, in the future, I'd appreciate keeping our disagreements between us. Severide: Okay, well, did he even mention what I said? Casey: He said you pushed for rapid extrication, and I ignored you. Got an entire sermon on command humility. Severide: Maybe it was one worth hearing… I didn't... I didn't sell you out, Casey! That's not who I am. You should know that. Grissom: What's your read on your new captain? He buckling under pressure? Could always put someone else in his post. Boden: Captain Casey is a damn fine officer. Anyone who takes aim at him has to go through me. Grissom: Understood, your house, your call. Boden: What exactly are you getting at, by the way, if you don't mind me asking, baiting my two officers against each other? Grissom: I remember my first few years on Squad. Battalion Chief made it house policy... Every six months, somebody was out on their ear. Law of the jungle. Kept us sharp, hungry, responsive to command. I know you got a bond with these guys, but we're running a city service, not a day care, Wallace… Here's what I can do. I'll call HQ, work a little magic. Have them spin it so there's no blowback to the captain. That'd be a favour. Me to you. Boden: And I'll remember that. Grissom: Anything comes up on this, you'll be the first to hear. I'd appreciate the same. Grissom: Good to see you again, Chief. Grissom: I'll keep in touch. Trudy Platt: I'll be pulling some overtime, so I need you to go shopping. Station got hit with a triple homicide, cartel-related, real bloodbath. Where's your pen? Mouch: I will have one shortly. Trudy Platt: What? Christopher, use your words. Herrmann: Would you mind maybe ixnaying on the homidenay around the kidnay? Trudy Platt: Oh, hey, squirt… Hand me the remote. Annabelle: Are you a police officer? Trudy Platt: I'm a police sergeant. Annabelle: Have you ever used your gun? Trudy Platt: Sure. I got some stories. Dawson: So, it's looking like Casey and I can't go to the spa after all. He wants to pay his respects at the deputy's vigil, and I don't blame him. Dawson: Here's the good news. Brett: No. I don't know what to say. Dawson: You don't have to say anything. Early birthday gift. Brett: Wh... Hey, these are for two. Brett: Right. Hey, Stella, any interest in a spa day with me tomorrow? Kidd: I would, but I got a date. Sorry. Kidd: Ah, ask your roomie! Cruz: Shoulder's been stiff from doing R&D on the Slamigan. Massage sounds good. Tomorrow, you said? Cruz: Great! See you there? Brett: Uh, yeah, for sure. Severide: What are you doing up here? Kidd: Heard you and Casey got into a tiff, and, uh, the thought of you sitting up here brooding all alone was too sad to ignore. Kidd: I've never been up here. It's nice. Sam: Whoa... Stop the car! Kidd: That doesn't sound good. Sam: Hello! Hel-lo! Hey, where is everyone, huh? Where are all the firemen? Severide: Hey. What's the trouble? Sam: The trouble? My buddy's dead, man. That's the trouble. What are you doing? Kicking back? Smoking a damn cigar? Severide: You want to help your friend, here? Sam: I don't need help! Driver: Come on, man, cool it. Sam: Who is this? Are you the Chief? Boden: Yes, I am. You should listen to your friend. Get in the car and leave before you say something you're gonna regret. Sam: Keefe was counting on you. You let him down, man, you let him down! And the next time you all find yourself in a jam and you want to call on us for help, I want you all to keep that in mind! Driver: Sam, come on. Let's go. Sam: I'm going, bro. I'm going. Trudy Platt: I know a few of these county guys. They're just blowing off steam. If you want, I can put in a good word, see if it doesn't smooth things over. Boden: Anything you think might help. Trudy Platt: Look... You had a split-second decision to make. Lives on the line. Most of these guys have been there at some point or another. Just give 'em time, they'll understand. Boden: I'll walk you out. Dawson: Still think it's a good idea to go to that vigil? Casey: I want to pay my respects. If there's trouble, we'll leave. Otis: You sure she was being genuine with her invitation? Cruz: I figured she was. Otis: Mm-hmm. Well, what'd you say? Cruz: I said, yeah, why not? Cruz: What "dude, Joe"? Look, getting a massage sounds a lot better than hanging in the apartment all day. Otis: Don't you think it's a little intimate? Cruz: It's not like we're massaging each other. Otis: And respect for personal space. So if you ruin this, I will not be happy. Mouch: What exactly was Cindy mad about? Herrmann: Well, she says that I didn't give Annabelle, you know, quote unquote "the real firehouse experience," whatever that is. Kidd: Did you take her on the truck? Herrmann: What? Heck no! That hunk of bolts with the busted safety belts, are you out of your mind? Kidd: Yeah, how about a ladder demonstration? Mouch: Did you show her how the engine pump works? Herrmann: Mouch, do you know how an engine pump works? Kidd: Yeah, I'm with Cindy on this one. There was a lot of TV going on yesterday. Herrmann: Okay, fine, all right? You know, maybe I could've done more, but, I mean, is it so bad if my little girl decides that she doesn't want to do some dangerous job that her dad does? I mean, she's a smart kid. Kidd: Okay, all I'm saying is that your little girl is her own person. And one day, she might throw you a curveball. Herrmann: She's eight! I got a few years before she comes home with a nose ring. Right? Casey: We don't have to stay long, stick around for a minute, make a donation, head out. Dawson: I'll follow your lead. Sam: Excuse me. You folks family, friends, or with the department? You both look familiar, I just can't remember where. Casey: I'm Matt Casey, and this is my wife, Gabriela Dawson. We, uh... Met last night. Sam: That's what I thought. You a fireman. Dawson: Paramedic. Same house though. Casey: We just wanted to come, pay our respects. Sam: Keefe was a good guy. You know, one of the really rare ones. Sam: No, man, you can't… Keefe was the kind of guy that made everyone around him better. He made me better… And now... What? Leaves behind a wife. There's no kids, a bunch of empty plans. How do you make sense of that? Dawson: No, we're good, thanks. Sam: Come on. I'll introduce you to some of the guys. Brett: Well, I'm about 90% ready for bliss. I'm... I'm still waiting on my spa partner, he's running late. Brett: And... And just... Just to be clear, when I say partner, I don't mean it in a romantic sense. Brett: We're friends. Um, could I ask your advice? How do I make sure that I don't send the wrong message in this scenario? I mean, he's a very sweet guy with a smile that you never want to see go away, and it's not as if there aren't feelings there anymore, it's just I don't want to lead him on. Mouch: Sorry, sorry, came as fast as I could. Mouch: Oh, yeah, Cruz had a family thing, didn't really catch the details. Do we get to keep these robes at the end? Or is there some sort of charge for that? Lady: I'll go get your masseuses. Kidd: Mmm, good call on the thin crust. I could eat, like, three more. Kidd: Okay, good. The guy that I... That I stay with, he always keeps us stocked in the fridge. Zach: This is the, um, Squad guy, right? Zach: How long you guys been living together? Kidd: Not long. It just... I... I lost my apartment and he let me crash. That's all… Can we talk about something else? Kidd: It's also... It's not a permanent thing, this whole living situation with Severide. And I just wanted to put that out there just in case you were worried. Zach: So anyway, Bryce... He's the guy. Herrmann: Hey, Chief. What are you having? Grissom: Scotch neat, plus another of whatever Kelly's having over here. Grissom: I hear congratulations are in order. Word at headquarters is you're getting a commendation for tackling that prisoner. Severide: First I've heard of it. Grissom: Hey, hold your head up. This is good news. Severide: Did you put in for the award? Grissom: All that matters is how you use this to your maximum advantage. The wind isn't always at your back, Kelly, so you have to take these moments when they come. 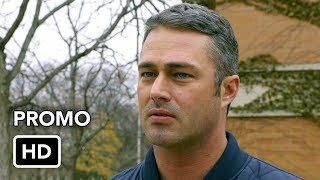 Severide: A sheriff's deputy just died. My friend's catching heat for it. Severide: To hell with my father. And to hell with this. I got into this job to save lives, not to play leapfrog. Find someone else for whatever you're trying to do here. I'm not your guy. Trudy Platt: You see our guy? You want to call for backup? All right, your collar. Let's do this. Christopher Herrmann? Herrmann: Hey there! Annabelle, what are you doing here? Annabelle: Mommy signed me up to be a Junior Police Explorer. Herrmann: Oh, she did, did she? Trudy Platt: You want to do me a favour and put your hands where we can see them? Herrmann: Why? What's going on? Trudy Platt: That's a written warning. Truancy violation. Apparently, you failed to properly notify your daughter's school prior to her Take Your Daughter to Work Day absence on Wednesday. Herrmann: I was supposed to do that? Trudy Platt: Next time, it'll be a $300 fine. Herrmann: Whoa, 300 bucks? You... Okay, fine, sorry, Sergeant. Trudy Platt: You want to hit the road? Herrmann: All right. Stay safe, have fun. Trudy Platt: Let's vamanos. Donuts are on me, dude. Otis: Who would've guessed Herrmann has a cop in the family? Herrmann: Hey, don't even think it. Kidd: Hey, Kelly, um... You know I appreciate you letting me crash these past few weeks, but I think it's time. Um, I'm gonna start that apartment search again. Connie: Lieutenant, Chief wants you. Boden: I got a call from headquarters. Looks like you're getting a commendation for your efforts on that call the other day. Severide: Right, I, uh... I heard something like that was in the works. Boden: Well, I just want to give you the good news, start the shift off. Severide: Appreciate it. The thing is... I'd rather pass. Severide: On the commendation, respectfully… I just prefer to do my job without a ton of fanfare about it. Boden: I don't think anybody could ever accuse you of being in it for the glory, Kelly. What's this about? Is it Grissom? Severide: He thinks of me like a son. Has his own plans for my future. I'm pretty sure he cooked up this commendation to try to motivate me up the chain of command. And I don't want it! Boden: Kelly, I understand not wanting to be defined by somebody else's ambition. But you gotta learn to take credit when credit's due. Radio: Truck 81, Squad 3, Ambo 61, Hazmat Unit. Industrial accident, Lakeshore Drive. Boden: We need an EMS plan one and a still and box alarm. Casey: Let's get everyone cleared back as far as possible. Dawson. Get triage started. Casey: Severide, as soon as Hazmat gives their assessment, I want you leading the charge. Severide: Yeah, you got it, Captain. Herrmann: Come on, let's get you out of here. Victim: There's still a ton of people inside. There was an explosion in the welding area. Pipes are bursting all over. I smelled smoke... I think it was chlorine. Boden: Engine 51, get a fog line covering the main door. We still have victims inside. Zach: Chief, we're in a highly combustible situation that's gonna get worse as long as that gas is flowing. We need to get in there, see if we can stem the chlorine leak before it combines with more acetylene and we get another explosion. Boden: Understood. I want you working with Squad. You go in, you locate the source. Truck 81, you handle search and rescue. Casey: Copy that, Chief. Mouch, Otis, Herrmann, with me. Kidd, stay behind in case we need anything. Zach: I'm thinking following that smoke should lead us towards the leak. Herrmann: This place is a maze! Casey! Casey: Grab whoever you can! Casey: Chief, we got several victims down at our location, over. Otis: Metal and concrete's interfering with reception! Man: Over here! We need some help! Mouch: Hey, buddy, don't worry. We'll get you outta here. Man: Right here! Right here! She's right here. Casey: Ma'am. Ma'am, can you hear me? Kidd, can you hear me? Casey: We need the cutters down here, quick! Kidd: Copy! I'm on my way! Firefighter: Chief! Chlorine and acetylene levels are both rising again. If those two gases find each other, the blast'll be twice the size as the last one. Firefighter: Hard to say... Five, ten minutes if the release rate holds steady. Boden: All units, let's wrap it up in there. Let's start working towards an exit. 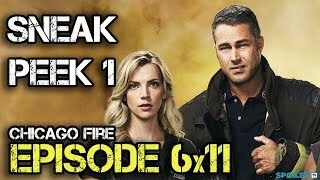 Boden: Severide, we are running out of time for you to shut down those leaks. Severide: Yeah, copy that, Chief! Over here! Zach: We need to find the main shutoff valve for the acetylene and the chlorine. Where're they at? Victim: Acetylene valves are right up there. Chlorine tank is up on the roof! Severide: All right, Capp, Cruz, get these guys out! Cruz: Yeah, you got it! Hey buddy, let's go, come on! I got you! Severide: Hey, Chief, we found the location of the acetylene shutoff valve. Zach: Right there! This should be it! The acetylene shutoff valve? Zach: Damn thing's stiff! Probably hasn't been moved in years. Severide: Hey, be careful, man! Severide: Zach! Zach! Hey! Hey, Zach, talk to me, man! Just breathe, man! Mayday! This is Squad 3. I got a man down! Chief, the valve's compromised. I can't shut the gas off from here. Casey: Kidd, Kidd, up here! Help me hold her in place. Severide: Mayday, this is Squad 3. I got a man down. I repeat, mayday! Casey: Kidd! Hold her still while I cut the brace. Firefighter: Chief! With the valve blown, our release rate just spiked. We got maybe three minutes. May not have enough time to evacuate everyone we've got in there. Boden: Got it. All units, pull out. Pull out now! You have... Immediately... Copy! Severide: Just keep breathing, man. Herrmann: Hey, Chief, I haven't seen any sign of Casey. He should've been out by now. Herrmann: It's like a crypt in there, you can hardly get a signal in or out. Boden: Casey, you have to evacuate immediately, do you copy? Casey: Kidd, how's your sense of direction? Kidd: I can't tell if we're coming or going. Casey: Dead end. Damn it. Boden: Casey, report. C... Report. Severide: Cruz! Here, take him! Hey, Cruz. How many people are down there? Cruz: A ton! Wait... Where are you going? Severide: There's a shutoff valve for the chlorine on the roof if I can get to it! Casey: We're on the right track, almost there. Severide: Chief, I'm headed for the shutoff valve on the roof. See if I can buy us some time. Casey: Wait, wait, wait, stop, stop, stop, stop! Is he out of his mind? Kidd: What are you doing? Casey: Chief, I'm gonna help Severide. Firefighter: We gotcha. I got her. Kidd: Got her? Hey, is he okay? What happened? Dawson: Took in a heavy dose of smoke and gas, but he's breathing. Kidd: He went to get Severide. Severide: I almost got it! Severide: I'm not leaving till I get this shut! Casey: Damn it! Chief, I found Severide! We slowed the gas to buy some time, but the valve won't stay closed. We need to hold it manually. Should be able to keep it at bay long enough to get everyone out. Boden: Don't press your luck. You see anything off, you bail, understood? Casey: If we live through this, I can't tell if you'll get a reprimand or another commendation. Severide: I turned it down. Severide: It was just something that Grissom was pushing. Tried to use it as a way to toss me up the ladder. Casey: I suggested the commendation. 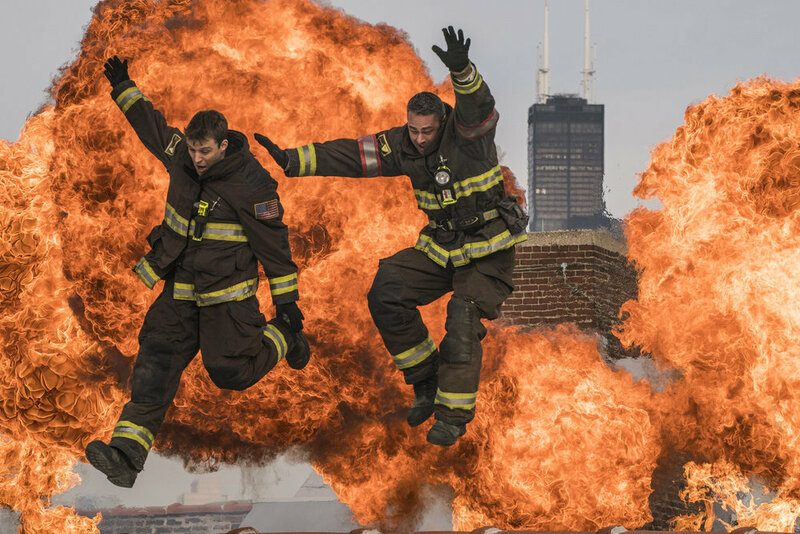 Boden: Casey, Severide, we're all clear. Get out of there, now! Severide: So what now? Soon as we leave this thing, it's gonna blow. Casey: How many steps do you think it is to the edge of the building? Severide: To do what? Jump? Casey: Sure. We let go, make a break for it, jump into the water… Come on, get ready. Count of three. La fin est sadique. Je compte les jours jusqu'au 1er mars. 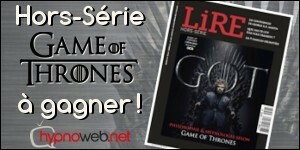 C'est trop frustrant cette attente d'un mois !! J'ai l'impression que la série venait à peine de revenir et déjà une pause !